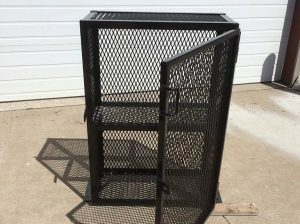 The client requested a propane cage that would hold 4 propane bottles. I suggested to the client that powder coating would give it a better finish and would provide better rust prevention. There is not a single bolt or nut in this design. Even the hinges were fabricated from scratch.